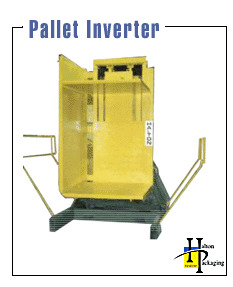 A pallet load of product is placed into the jaws of the pallet inverter by a forklift truck. The machine operator presses the clamps closed button on the machine control panel. The jaws will close and apply pressure to the load until they receive the pre-adjusted back pressure on the system. Then the rotate button is pressed and the machine will rotate 180 degrees. Upon reaching its inverted position, a proximity switch will engage the machine to stop. The clamps are then opened and the old pallet is removed by the machine operator, while being replaced by a new pallet. The reverse cycle would then commence.